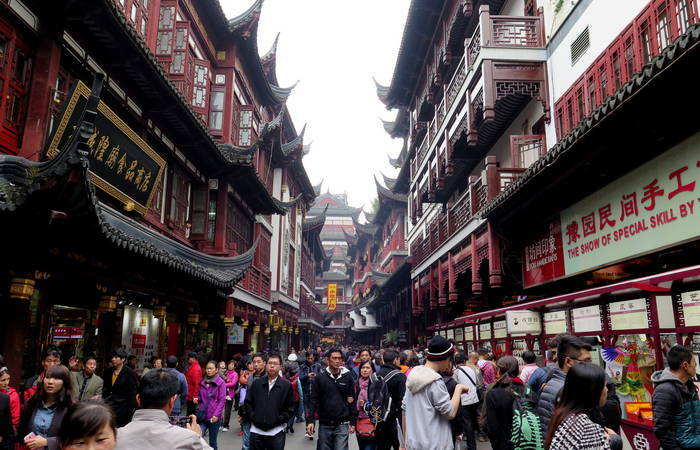 Located at the northern end of Yuyuan Shopping Mall, Yuyuan Old Street is adjacent to the famous garden - Yuyuan. The street offers a combination of traditional specialty products of the Laocheng Temple in Shanghai. The street is home to some China time-honored brands such as Wang Dalong, Liyunge, etc. Visitors can also find the unique chopsticks shop and walking sticks shop there. Originally built in 1907, Yuyuan Old Street features many antique buildings with national features. It is more than 100 meters long. The street is line with a variety of shops, including Jewelry shops, boutique shops, local food restaurants, local specialties shops, and so on. At the street, you can enjoy the authentic steamed bun with crab roe soup stuffing with other popular local food. If interested, you can see the lantern show at the street in January. If you are planning to visit Yuyuan Old Street for photography purposes, the best time to visit is in the evening (please note there will be many tourists in the evening there). There are several buses passing by Yu Old Street. Therefore, there are several options. Rent a vehicle to the street. This is the quickest and most direct option. Take Bus 11, 26, 64, 71, 145, 581, 715, 730, 736, 801, 926, 929, 932, 969 and Bus 980 to the Stop of Yu Garden (豫园站). Then, walk to the street. Take Metro Line 10 to the Stop of Yu Garden (豫园站). Then, walk to the street. Please take good care of your valuables as there are many visitors there at any time. Interested in visiting Yuyuan Old Street on a Tour? Wendy Wei Tours offers a variety of different packaged tours as well as custom tours including Yuyuan Old Street, among other attractions and destinations. To find out more, please visit our Tours page or Contact Us directly to find out more.